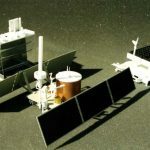 Space Equipment – SMARTT: Scale Models, Arts, & Technologies, inc. This set of miniatures is an exact scale replica of equipment used by NASA on some of the Apollo space missions. Not generally recognized by the public, these items are among many of the unsung heroes that helped the astronauts achieve the success of many of their experiments on the moon.